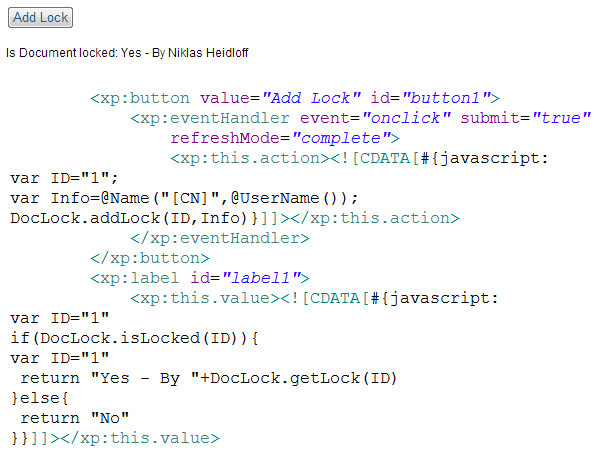 As part of the XPages development contest sponsored by WebGate Consulting AG which is part of the Appathon sponsored by IBM developerWorks, Fredrik Norling has contributed a project called XPage Document Locker. The project includes a managed bean with methods to lock and unlock documents. The mechanism works if all users access the same replica. The documents are not physically locked but instead a programming convention is used to check whether documents are locked before someone tries to change them.